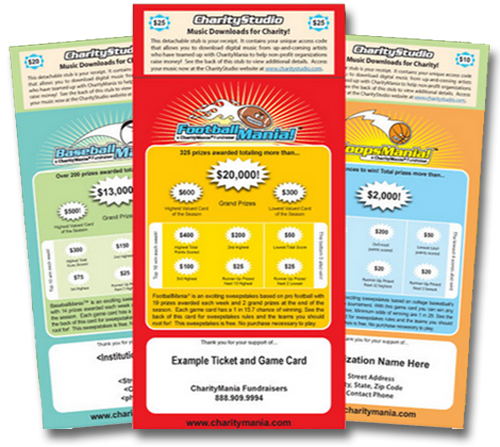 CharityMania’s unique sweepstakes fundraisers are based on the excitement of professional and college sports. You sell CharityMania Tickets to raise money and keep 70% as profit. Ticket holders receive a great collection of digital music, and they are entered into a sweepstakes where they can win $1000s in cash prizes based on the results of the sports teams printed on their Sweepstakes Game Cards. Check out our unique sweepstakes fundraisers below that are based on your favorite sports! Don’t just play an ordinary “Squares Pool” game during pro football’s championship game. Instead, use FootballMania SuperMatch to raise money during the biggest, most popular sporting event of the year! This popular fundraiser is based on the exciting “Squares Pools” games played during pro football’s championship game. Take advantage of this unique event and unique fundraiser to raise money! You earn 70% profit with each $5 CharityMania Ticket sold. Tackle your fundraising goals and score a fundraising touchdown with FootballMania! Sweepstakes participants can win $1,000s based on the performance of the randomly assigned football teams on their Game Card. FootballMania is our most popular fundraiser. Sweepstakes participants have a chance win prizes each week of the pro football regular season. You earn 70% profit with each CharityMania Ticket you sell. Get 7 extra weeks to sell before the sweepstakes begins. This is really helpful for schools and other organizations that start fundraising in the late summer or fall. You earn 70% profit with each $20 CharityMania Ticket sold. Signup for this great fundraiser up through mid-November. This fundraiser offers all the same FootballMania excitement but takes place over a shorter duration of time. This is really helpful for schools and other organizations that start fundraising in the late summer or fall and need more time to sell tickets. You earn 65% profit with each $10 CharityMania Ticket sold. The perfect fundraiser for communities that love college football. You earn 70% profit with each $20 CharityMania Ticket sold. Your group will hit a fundraising home run with BaseballMania! Sweepstakes participants can win $1,000s based on the performance of the randomly assigned professional baseball teams written on the Game Cards. Sweepstakes participants are assigned random pro baseball teams for 10 weeks of the season, and have a chance to win prize money each week. The Spring game starts in April during the first week of the professional baseball season. The Summer game starts in late July and runs for the last 10 weeks of the baseball season. You earn 70% profit with each $20 CharityMania Ticket you sell. This BaseballMania fundraiser works the same as the $20 fundraiser but with a lower price point. You make 65% profit on each $10 sale. HoopsMania is a fundraising slam dunk! Based on college basketball’s national championship tournament in March, it is one of our shortest and most exciting fundraisers! Sweepstakes participants have 49 chances to win a prize based on the performance of the 8 random basketball teams assigned to their Game Card. You earn 65-70% profit with each CharityMania Ticket sold (depending on which version you use). Score a fundraising “hat-trick” for your organization! HockeyMania is the perfect fundraiser for regions that are passionate about hockey. Sweepstakes participants can win $1,000s based on the performance of the randomly assigned professional hockey teams on their Game Cards. Sweepstakes ticket holders have a new chance to win a prize in each of the last 15 weeks of the professional hockey season. You make 70% profit with each $20 sale. GolfMania is a fundraising hole-in-one! Sweepstakes participants have 136 chances to win a prize – all based on the performance of 5 randomly assigned golfers from either the 4 Majors (starts in the spring) or the 4 FedExCup tournament (starts in the fall). You can win prizes for low or high scoring golfer combinations! This great fundraiser is based on pro golf’s 4 major tournaments. Your group makes over 70% profit with each CharityMania ticket sold. Want to raise money in the late summer or fall? The FedExCup Edition is based on pro golf’s 4 FedExCup Playoff tournaments. Your group makes over 70% profit with each CharityMania ticket sold. CharityMania is a family owned business that has been operating since 1994. Over our company's lifetime, we've helped over 20,000 organizations from across the country raise over $75,000,000! We pride ourselves on helping organizations raise money and build community involvement. Don't take our word for it, read what other organizations have to say about our CharityMania Fundraisers! © CharityMania. | All Right Reserved.